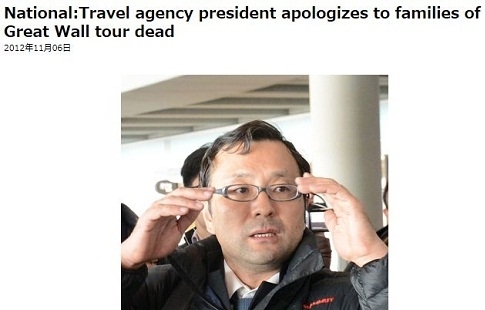 The president of the Tokyo firm that organized a tour of the Great Wall of China that turned fatal has apologized personally to two of the victims' families, the company said on Nov. 6. Amuse-Travel Co. President Katsumi Itai met in Beijing with the families of two members of the tour group caught in a snowstorm during a trek along the Great Wall on Nov. 3. Itai told reporters he would meet another two families after their scheduled arrival in the Chinese capital around noon on Nov. 6.